A north Wales pensioner has revealed how the support he received from a National Lottery funded British Red Cross over-50s scheme saved his life. Pensioner John Hyde admits he had “reached rock bottom” when he was put in touch with the Gofal (Care) befriending and enabling service for the over 50s in North Wales. The 66-year-old was being treated in hospital after a fall when he revealed how low he was feeling to a district nurse, and was referred to the British Red Cross Gofal service. Funded with nearly one million pounds (£988,452) from the National Lottery Community Fund’s AdvantAGE programme, volunteers from the project visit vulnerable older people like John in their homes for up to 12 weeks, helping them combat loneliness and isolation, and encourage social interaction by linking them up with services and social groups in their local communities. The project also offers a professional befriending service in beneficiaries’ homes, as well as telephone support. Three months on, times have changed and John now gets out and about with another John – volunteer and retired schoolteacher John Harris . . . I live alone with no family locally and I lost my leg through diabetes. Not only did I struggle to get out of the house, but at times I found it very hard to carry on at all. I really wanted to get out and about and meet people. I just got so low that I thought, kind of, that I should kill myself? Should I commit suicide and things like that? I was really down. I was just sat at home staring at four walls doing nothing. I’d reached rock bottom and I was talking to the district nurse and I blurted out something. I just couldn’t stand life any more. She said, you’re not feeling like that – I’m going to find someone to help you. I can’t praise John and the Red Cross team enough. They boosted me up and made me look on the bright side of things rather than just staring at four walls brooding over stuff. I was low, very low, and had thought about suicide but with the Red Cross I had someone to speak to and they took an interest and did something for me. John [Harris] was smashing. He would arrive each time and I’d say, go on John, surprise me. He’d take me out to Llandudno or Rhyl and other places and we’d just have a look around. We’d go to a café, have a cup of coffee and we would talk to people. I enjoyed it very much. I think with John being a school teacher I think he taught me how to get out and about again. I feel free. I feel as though I want to do stuff now. It’s just a great feeling to be out and about for me. 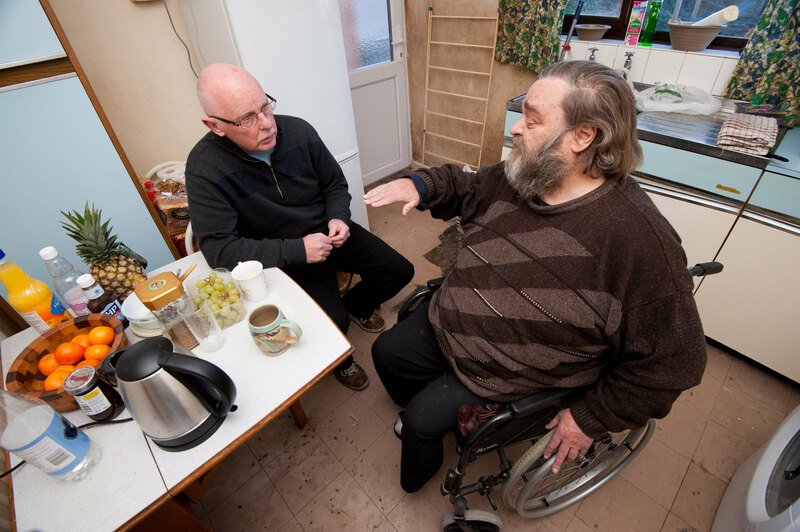 The Red Cross says as we live longer, often alone, more people like John will need support to get life back on track.